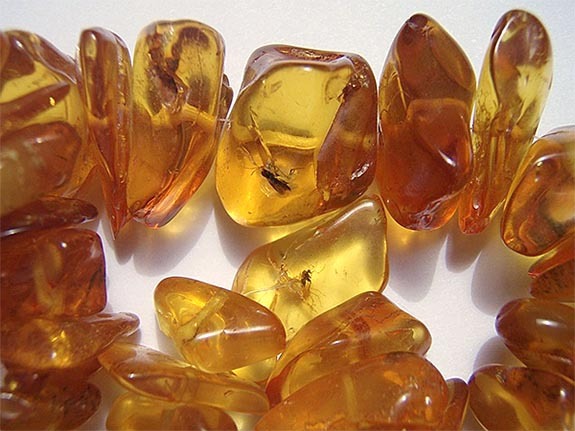 An international team of researchers has uncovered archaeological evidence suggesting that precious amber — the golden-colored translucent gemstone formed from fossilized tree resin — was prized by our prehistoric ancestors and traded throughout the Mediterranean region. Researchers used a sophisticated technique known as infrared spectroscopy to analyze amber jewelry and other amber ornaments found at archaeological sites on the Iberian Peninsula. While most of the samples, which dated from 4000 BC to 1000 BC, were determined to be of local origin, other samples were linked to amber that originated from Sicily and the Baltic regions. Mercedes Murillo-Barroso from the University of Granada, Spain, believes this is evidence that amber was circulated through vast exchange networks across the Mediterranean, with the likely path of Baltic and Sicilian amber routed through North Africa. The findings were published in the journal PLOS ONE. “This suggests that amber from the north may have moved south across Central Europe before being shipped to the west by Mediterranean sailors, challenging previous suggestions of direct trade between Scandinavia and Iberia,” co-author of the study Marcos Martinón-Torres said in the statement. The team reported that the Sicilian amber arrived on the Iberian Peninsula at least 4,000 B.C. Baltic-sourced material was dated from 1,000 B.C. Rare amber specimens exhibit neatly preserved plant matter and other creatures that became trapped in the resin and then frozen in time. Today, 90% of the world’s amber comes from Kaliningrad, a Russian territory tucked between Poland and Lithuania on the coast of the Baltic Sea. Due to the collapse of the Soviet Union in 1991, the Kaliningrad Oblast became an exclave, geographically separated from the rest of Russia. Credit: Amber image by Brocken Inaglory [GFDL or CC BY-SA 3.0 ], from Wikimedia Commons.